Hi Nitromians and Pixel Love Fans. Todays Pixel Love game is Ribbitation. 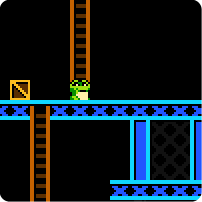 In this retro pixel inspired game you must control a frog through various levels of climbing ladders and pushing crates. The mechanic is simple and the style is retro giving this a very nestalgic and fun feel. If you have any ideas for next weeks pixel love game, please leave your comments below. You have seen the previews and now the countdown has begun. This Wednesday Vault! will be hitting your app store. I thought as it is a Friday that we'd surprise you with a snap shot of a game currently in development. It's one of the Free level based games we are working on at the mo. We don't have a name for it yet, but the current codename is Plod! The premise of the game is that you play as a GIANT set of feet that have been shackled together. The greedy villagers have ascended to the world above after rumours of giant gold coins. I won't spoil you with details quite yet and will leave you to guess at how the controls will work and some of the features of the game. More news on this game as it progresses, until then click on the shot to see the full image. Today we are happy to give you a new update to Magic Touch Wizard For Hire. Update 3 to Magic Touch brings with it a whole new game mode 'Time Attack'! No longer do you have to worry about those pesky knights reaching the floor now it's all about the clock. Kill as many knights as you can before the time runs out and make combos to gain time back. Make sure to watch out for the new Spider Knights bomb attacks! Click here to download the update now. Sorry for getting this blog post up a day late. This weeks Pixel Love game is Egg Knight. 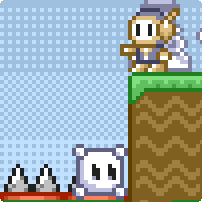 Defeat the Dark Army and Save the Egg Knight World in this weeks Eggcelent pixel game. Play as different Egg Knight each with there own unique set of skills. Remember to offer your suggestions for pixel love games via the pixel love website. Today marks the sad day that we take Touchy offline. The app has been unavailable to download or to make payments within for three months while we wound things down. For further information as to why the service has ended you can read the original announcement post here. All links and categories related to the Touchy app should now be inactive and games that contained the API to link to the Touchy service should now have been changed or are in the process of being changed for versions that do not contain it. We are unsure but Touchy may still function in the Nitrome games featured at BrassMonkey.com. Please feel to try and if they do you may continue to enjoy them there for the time being. We have no immediate plans to challenge them remaining there. We also do not control that domain and are in no way associated with any remaining service that may continue to function. Please do not contact us if it does work but fails to at a later date. Though it is always sad when some functionality goes away we hope that many of the better gameplay concepts may materialise in our future apps. We are making apps now at a greater pace and already have tapped into past projects a few times. Most noteably the Magic Touch Touchy integration was what eventually led to the new Magic Touch app. One of the most notable losses will be the loss of the virtual joypad particularly for multiplayer games. Though touch screen is not an ideal replacement for physical keys it didn't distract from the fact that 4 player can be a blast to play. Games will be limited to 2 player but there could be a possible solution in the longer term (note...this is not a promise). Before leaving Tom was as part of the WebGL work looking for a work around to a key input problem that existed there. The solution he produced also allowed for joypad support and they would function on both the WebGL builds and Unity. So that will hopefully come soon after or with the WebGL support! It is possible with a little more work that we could extend the function to flash games. If that were the case it could allow the multiplayer functions to exist in the future. Label it as a maybe for now! So that concludes Touchy. We hope that people do not morn it's passing too much and remember that the time we used to spend on Touchy integration can now be used on other things! Thank you for your continued support and welcome to our new followers. If you are new here head over to our Games section to play now. Finally if you are not currently one of our followers (why not!) 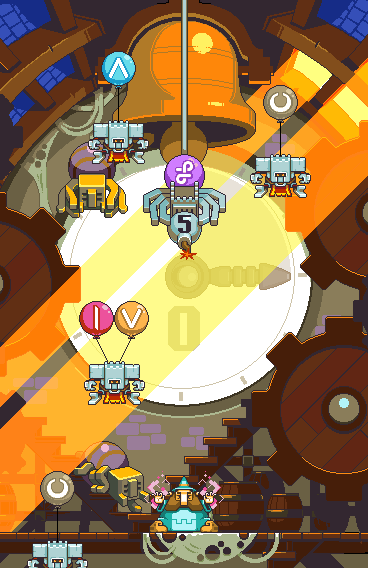 head over to @nitrome and join in the action. 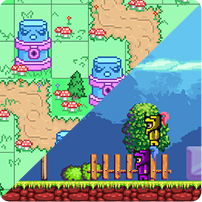 Tiny Treasure & Pixi Tower Defense are this weeks Pixel Love Games! 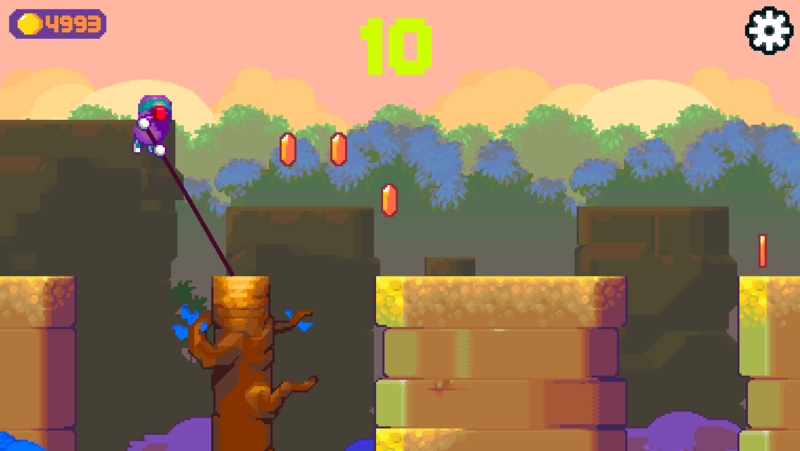 In this cleverly designed pixel game you control two heroes who must work in tandem to complete the levels; using such actions as leapfrogging and standing on top of one another. The game is quick and is easily completable in 1 sitting. 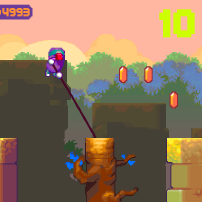 So head over and try to conquer this pixel platformer with a twist. Nothing will stop the march of the monsters in this enjoyable tower defense game. Strategically place down heavy artilery and help protect your pixel lands. Have fun playing, there will be more Pixel Love games next week. 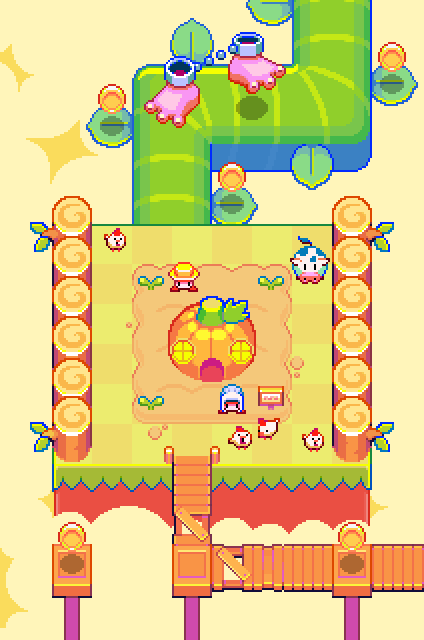 We are working hard on several new releases here at Nitrome towers (well four to be exact), with a mixture of both endless high score chasers and more traditional level based games. 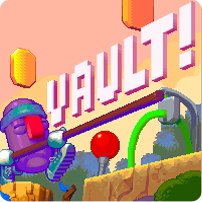 Today we thought we'd show off some gameplay footage of our super fun and addictive game Vault! It's fairly far on in production now so we expect that it'll be the next game released for mobile! We are not quite ready to reveal our other two 'Level' based games quite yet. But if your lucky we'll show off a screenshot next week. 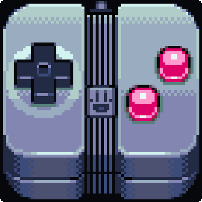 Retro Runners is an endless runner in which you need to use your acrobatic cybernetic skills to traverse through a gauntlet of blocks, bats, boulders and robots. This is a very difficult game that gives you a enormous sense of accomplishment when you manage to combo through three or more obstacles. The music is very frantic. The main draw for me though was the pixel art design. Also, you play as a character that fondly reminded me of Robocop! Have fun everyone, more Pixel Love games next week! 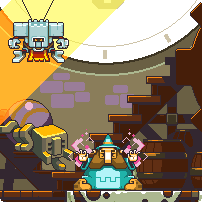 Well, today marks my last working day at Nitrome, what a fantastic time I've had! During my time here, I've had the opportunity to get to know people that have both inspired me creatively and challenged me intellectually - fuelling my passion that keeps me doing what I love to do. I am truly grateful to everyone at Nitrome Towers for this! 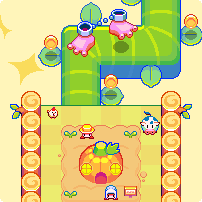 I also want to wish Nitrome the very best of luck in doing what they love doing, making awesume games! Also, thanks to all of you - the Nitromians, Wikians and fans that have all helped me track down bugs, build new features and make the Nitrome web experience what it is today. We know that there is still much more we want to give to you in regards to the web side of things, so with that in mind, I would also like to wish the new web developer the best of luck in all future features, updates, upgrades and projects moving forward. If you would like to keep up to date with what I'm doing, you can always follow me on twitter. Thanks again for everything! Thank you everyone, I've had a blast! 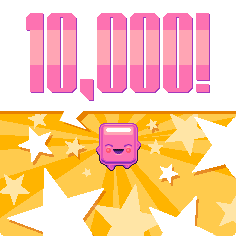 Magic Touch: Wizard for Hire continues to do amazingly well for Nitrome and has now surpassed a whopping 6 Million Downloads! To celebrate this we have been working on a 3rd update to the game which we have just submitted to the app store for review. 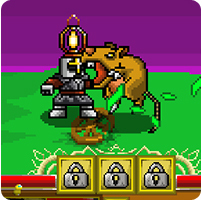 The game contains a new mode called Time Attack which you can see in the preview image. A lot of how you played the game before changes in this mode so you can all have fun competeing on a new scoreboard when it's out! Melee Man is this weeks Pixel Love game! 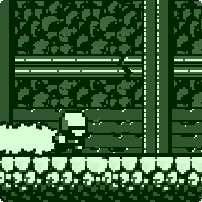 This platformer was a wonderful little game created by The Village BlackSmith. The game tasks you with bouncing off of cannon balls, enemies heads and more to make your way through some very clever and difficult puzzles / boss fights. The Village Blacksmith brings a unique style of Pixel Art that we really enjoy and David vs Goliath beings another great soundtrack! Apologies for bringing the post a day later than the game being highlighted on Pixel Love. Thanks for playing everyone, more Pixel Love next week! 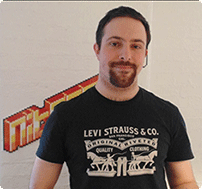 we have been a little quiet of late in revealing what we have been up to here at Nitrome Towers. Rest assured that we have four games in development as we speak (one of which we showed previously). So time to reveal another game! 'Vault!' (yes with an exclamation mark) is a game about erm vaulting. Its simple to control but has a surprising amount of depth and it is super fun to send the character into the air over the vaulting stick. We will have more on the other games that we have in development soon but in the meantime we will let you all guess on what this game is all about! Once again Lonnie has posted a very funny video playing one of our games. This time it's our latest action puzzler Green Ninja: Year of the Frog. Massive thanks to Lonnie for his continued support. So grab a cuppa and have a watch!